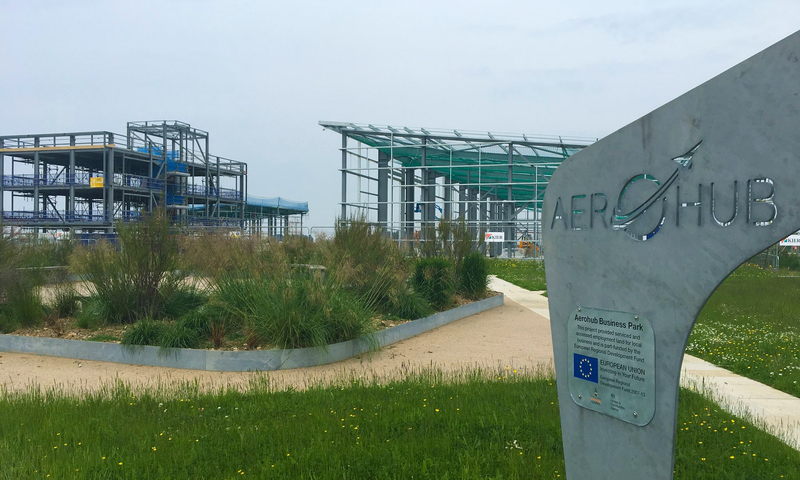 The Aerohub Enterprise Zone (Phase 1) Plot 2 project at Newquay Airport is a £8M BREEAM Excellent scheme located within the Aerohub Enterprise Zone at Cornwall’s Newquay Airport and forms part of the Workplace for Local Jobs Initiative as well as a key driver for aerospace and space business in Cornwall. The scheme includes office and industrial units with built-in flexibility for a variety of uses and future alterations, maximising opportunities for potential tenants and enhancing the value of the project. Site circulation has been developed to be efficient, integrating with the established public realm area and the office has been predominantly placed to address the wider approach from the new Southern Access Road. This innovative design proposal has successfully received ERDF funding and is now on site with Kier Construction. The site benefits from full planning via a Local Development Order (LDO) that was granted in order to provide a simplified planning framework for the Aerohub Business Park, to bring development to the area and speed up delivery, simplifying the planning process. The Local Development Order was formally adopted in 2013 and granted planning permission for a 35.5 ha Business Park consisting of business, general industry and storage and distribution with associated infrastructure and ancillary hotel, retail and leisure facilities which will be developed over the next 20 years. Bailey Partnership’s pilot scheme proposals for Plot 2 include the development of office/light industrial units in a form and massing that achieves the objectives of the LDO, maximises the potential of the plot and delivers a high level of rentable floor space. The choice of materials is a contemporary response to the technology aspect of the aerospace-related business park. The materials and details are required to be robust and withstand the exposed marine environment. The industrial units are designed to be dual aspect, with outward facing facades and internal facing aspects to the courtyard. The gateway office building is three storey with a largely glazed ground floor to accommodate commercial office units or showrooms.